ULA Equipment is an American owned and run gear company based in Logan, Utah, which specializes in ultralight backpacks. ULA’s best loved product is the Circuit, a 68L pack made with highly durable 400 robic fabric and a super simple, ultralight design. The ULA Circuit is made with individual sizing for the hipbelt and torso, meaning hikers can dial in their ideal fit. Meanwhile the roll-top closure on the Circuit makes this pack’s size highly adjustable, expanding to fit a full bear canister vertically in the main compartment, and then rolling away when carrying smaller loads that require less space. As with all ultralight gear there will always be some give and take when it comes to durability and features. At two pounds nine ounces the Circuit is not the lightest pack on the market, but those extra ounces come from more durable body fabric, a well-padded hip belt with two roomy pockets, a front mesh pocket perfect for stow and go items, and shock cord that allow you to carry a family-sized bag of potato chips out of town. And, compared to more standard-fare backpack, it is still extremely light. We’re awarding the ULA Circuit our Classic Pick for Ultralight Backpackers. The ULA Circuit is built well enough to handle multiple thru hikes and is comfortable and light enough that you’ll find yourself using it as your go-to day hiking bag as well. With all this functionality, it has become one the of the most popular backpacks along the Pacific Crest Trail. The Circuit’s durable design features everything you need and nothing you don’t, making it perfect for thru hikers and weekend warriors alike who are looking for a bag that can go the distance again and again and again. Compare this backpack with the Gossamer Gear Mariposa 60, a former Classic Pick backpack for the Ultralight Backpacker. If you want more storage options, but less durability, this may be the pack for you. Read the full ULA Circuit review below. Weight 2 lbs 10 oz. (1.17 kg) Not the lightest backpack on the market, but close to it. A respectable weight for an ultralight backpack with 68 liters of space. Capacity 68L This is a ton of room. Great for thru-hikes as you’ll ocasionally fill up for long stretches, and then can roll the top down as the pack empties. Learn more about backpack capacity in our Guide. Frame Internal Foam Frame and Single Aluminum Stay The Circuit has an internal frame that’s made of dense foam and a single aluminum stay. This is good support, but not a ton compared to more normal backpacks. The aluminum stay is removable. Frame Material Dense Foam, 1.2 oz carbon fiber, Delrin Suspension Hoop ULA uses dense foam and a carbon fiber suspension hoop to create a lightweight, movable frame. Hip Belt Fit 26-47+ in. (66-119+ cm), Pick size on order When buying the Circuit you can choose between XS, S, M, L, XL, and XXL sizes, each with a range of four inches. It’s not super adjustable after that, but it shouldn’t need to be. Learn more about backpack hip belts and how to measure in our Guide. Torso Fit 15-24+ in. (38-60+ cm), Pick size on order When buying the Circuit you can choose between S, M, L, XL and Kids sizes, each with a range of three inches. It’s not super adjustable after that, but it shouldn’t need to be. To learn more about backpack torso measurement and adjustable torsos see our Guide. Number of Exterior Pockets 5 Basic, but solid pockets for water bottles, hip belt items, and one exterior item (or two). Sleeping Bag Compartment No There is no opening at the bottom of this backpack. Hydration Sleeve Yes The Circuit comes with a removable hydration sleeve and port. Main Pack Access Roll Top You can roll the pack to its full 68 liter capacity, or roll it down to roughly 35 liters. Very versatile. Detachable Top Lid No There is no top lid to detach. Trekking Pole/Ice Axe Loops Yes Loops for hanging either ice axes or trekking poles are included. Materials ULA 400 Robic Very strong and light. Known for its durability and longevity on hard hikes like the Pacific Crest Trail. Load Range 15-35 lbs. (6-15.8 kg) This is an ultralight backpack, so make sure your maximum carrying weight is below 35 pounds. True comfort is around 30 pounds, meaning your base weight should be between 10-15 pounds. Warranty Limited Lifetime ULA has an excellent warranty and customer service. If anything breaks quickly, get in touch. Retail Price $235 A decent price for a backpack that will last you many miles. It was two months before the start of my Pacific Crest Trail thru hike and I was researching backpacks, again. Somewhere deep in my panicking monkey brain, finding a new backpack was the solution to the stress of packing my entire life into boxes and attempting to walk 2,650 miles from Mexico to Canada. If I could just shave a few ounces off, or if I could have different hip belt pockets or perhaps what I needed was more features and pockets — yes, these were the things that would ensure that I was among the 20% of thru hiking hopefuls to complete their journey. The ever-faithful ULA Circuit on the Pacific Crest Trail. I thought back to all the reasons I’d bought this pack in preparation for my very first thru hike on the JMT in 2017. No, it certainly wasn’t the lightest ultralight bag on the market, but it was a durable work horse. And no, it didn’t have a million pockets and zippers either. But I never found myself wanting for storage. Even after 220 miles through the Sierras and countless weekend trips, my ULA Circuit had proven to be nothing if not a stalwart companion. The top of Mt. Whitney on the John Muir Trail with the ULA Circuit. It was settled, I would start the PCT with my Circuit. I glanced over to see our two bags leaning up against the same tree. Mine with only my water filter and sit pad visible in the front mesh pocket, hers with an endless array of miscelanea attached to the outside. She had a point. Along the PCT. Even when worn the ULA Circuit is sleek-looking, because almost everything must fit inside the surprisingly spacious pack. A few items can hang in the back mesh, but it looks good on or off. One of the things I immediately loved about the ULA Circuit was how voluminous the main compartment was. Aside from items that I used repeatedly throughout the day, like my water filter, I never felt the need to store anything externally on my pack. Now, this could also be attributed to the Circuit’s general lack of external features, but the result was the same: forced organization. Within the bag’s cavernous depths all of my items had a home, a dedicated space. This left the outside pockets available for essential gear such as my water filter, chapstick, sunscreen, body glide, and my phone. I came to really love the simplicity and ease of its design, which so clearly speaks to a product built by people who understand their customers. Hip belt pockets are clutch on a pack that has almost no external storage. It’s hard to write a gearhead review about a backpack that is admittedly so simple. The frame on the ULA Circuit is actually the most engineered part of the bag. It consists of one vertical aluminum stay, which provides rigidity and a single inverted-U hoop made from plastic and carbon fiber. This holds the back pad up and out while providing a little additional support under high loads. The main body of this bag is just a 60 (or so) liter chute with a roll top closure. Externally there are only five other pockets — two water bottle, two hip belt, and one mesh front pocket. That’s it. But also, isn’t that all you need? In the thousands of miles that I have hiked with this backpack I never found I needed more storage or features than this. The only exception being a pocket that I installed on the shoulder strap to hold my phone. The roll-top closure on the ULA Circuit. Expand or contract as needed. The key to using a simple bag like the Circuit is knowing how to pack the gear you have and making sure you’re not bringing too much. On their website ULA lists the Circuit’s carrying capacity at 35 pounds. After years of usage I can attest that this is a very accurate estimate and you’re best keeping your bag under 30 pounds for maximum comfort. Tired, or too heavy? The ULA Circuit has a maximum load limit around 35 pounds. The pack hasn’t reached that here — the hike is just gnarly. There are a few extra features that come standard on the Circuit, but which are somewhat less used. When bought new the pack comes with two hand loops on the shoulder straps for resting your hands in while hiking and two water bottle holsters, also on the shoulder straps. Internally the back comes with a clip-in hydration sleeve and a small items pocket. Admittedly I cut off or removed all of these features by the end of my first hike. The internal features were the most annoying as they only connect at the top of the pocket — this means that if your bag is not vertical they flop down like a doggy door, keeping you from accessing the rest of your gear. The features on the shoulder straps aren’t really functional for those with a shorter torso like myself as they position themselves under your armpits and totally in the way, so off they went and I have never missed them. There are enough straps for cinching and storage, but very few extras. And all the straps included are removable. The beauty of minimalism shines in the ULA Circuit, and you can easily take out any of the extra features you don’t love. The ULA Circuit gets a four star comfort rating from me, losing a star because of some issues with pack chafe in hotter temperatures and because the shoulder straps are placed a little wide for those with narrower frames. As with any ultralight pack you need to be conscious of your base weight and gear needs. With any load under 20 pounds this pack is a dream; anything under 30 pounds and it’s pretty dang good. However, once you have more than 35 pounds in this bag the comfort begins to deteriorate rapidly as the minimal frame starts to warp and transfers all the load into your shoulders. I have never worn an ultralight pack that doesn’t have a dramatic weight versus comfort tipping point and the Circuit is more forgiving than most. However, if you’re going to go light you have to commit to that idea before you buy an ultralight bag. The ULA Circuit gets a perfect five stars for durability. I took this bag on a 220 mile JMT thru hike, along 1800 miles of the PCT, and on numerous shorter weekend and day hikes. I have set this bag on sharp rocks, tossed it down canyon waterfall scrambles, and overloaded it with six liters of water, a bear canister and a week’s worth of food. Aside from being dirty, it still works great. After thousands of miles, the ULA Circuit is going strong. This is even more impressive when I compare it to my hiking partner’s Gossamer Gear Mariposa which was literally falling apart by the end of our PCT thru hike and started to show serious wear and tear even after our JMT thru hike. The packability of the Circuit is very subjective. While I would personally give it four stars, I could see how others would rate it as low as three stars. The main compartment of this pack is just a single chute with no built-in internal organization. How well your bag is packed is entirely up to you and how organized you are. However, the two large hip belt pockets, two water bottle pockets big enough to each hold a 2L Smart Water bottle, and the mesh back/shock cord combo make storing your gear a breeze. The ULA Circuit is mostly a single chute. This requires precise organization. The only reason I’m docking this bag a star is because I ended up supplementing a small shoulder strap pocket for my phone. During my thru hike my phone was also my map, camera, and contained all my media — I wanted a dedicated pocket for it that was easily accessible. For fit and adjustability I give the ULA circuit four out of five stars. The Circuit gains points for having independent hipbelt and torso sizing, load lifters, two types of shoulder straps, and dual strap hip belt adjustments. The ULA Circuit has decent adjustability, but mostly when you buy the pack. The hip belt does adjust with an easy pull, pictured here. However the pack loses a half star to account for the fact that all the adjustable features must be decided when purchasing it, and it can be hard to know exactly what you need then. Once you have the pack it’s minimally adjustable with the exception of buying a new hipbelt. I’m also docking a half star for being unisex in design — aka designed for a man. Somewhere along the hot, sweaty climbs of Northern California I realized that my Circuit had begun to chafe my back again. The issue that plagued me through the desert had returned as temperatures began to creep into the 90s. As mentioned previously the frame in the ULA Circuit is very minimal and doesn’t hold the pack away from your back. On hot days your sweat becomes trapped between your shirt and backpack with no way to evaporate. For me this always resulted in two long devil horns of raw chafe on either side of my spine. Conversely, on cool days I never had this problem and actually really enjoyed the feel of my backpack sitting against my back. However, after 1800 miles into the PCT I could no longer tolerate the idea of pack chafe and ultimately chose to swap packs with less than 800 miles to go. Even the S-curve shoulder straps aren’t really engineered for women. Comfortable, yes, but not outstanding. I would also like to note that this problem is not exclusive to the Circuit. 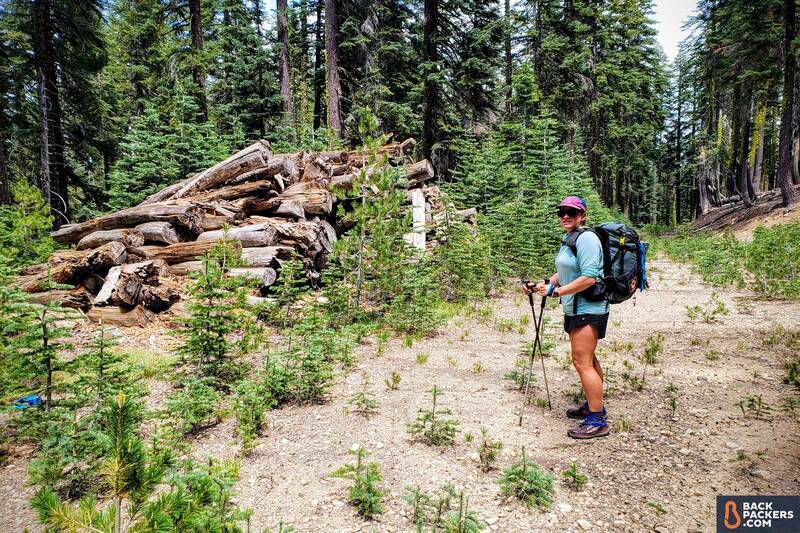 During my PCT thru hike I heard people complaining about pack chafe who were carrying Hyperlite Mountain Gear’s Windrider and Southwest packs, Gossamer Gear’s Mariposa Pack, and even heard complaints from folks carrying Superior Wilderness Designs packs. The unifying factor wasn’t the backpacks, it was the fact that the chafe sufferers were all women. As of the writing of this post Osprey is the only company making UL bags with a women’s specific fit, while all others claim unisex models. Of course, if you’re a woman you know that unisex really means designed and shaped for a man’s body and comes in extra small to accommodate a larger size range. On the Circuit this also presents as shoulder straps that were a little too wide for my frame, even using ULA’s ‘s-curve’ straps. We tested the classic ULA Circuit in the Original Green. Colors have been added, along with a trail-name stitching service and some extra sizes, but the pack remains essentially unchanged. Our tester used S-Curve straps instead of the J-Curve. ULA Equipment is a small cottage gear company. They make their packs in-house, and you can only buy them from the company. See the ULA Circuit below.